The couple made their relationship known in March 2017 when they were spotted kissing in New York City, though rumors about them started swirling in December 2016, a few months after Kruger split from longtime love Joshua Jackson. Kruger and Reedus met while filming the movie Sky, in which they played lovers. Kruger recalled that her first day on set was her big love scene with Reedus. 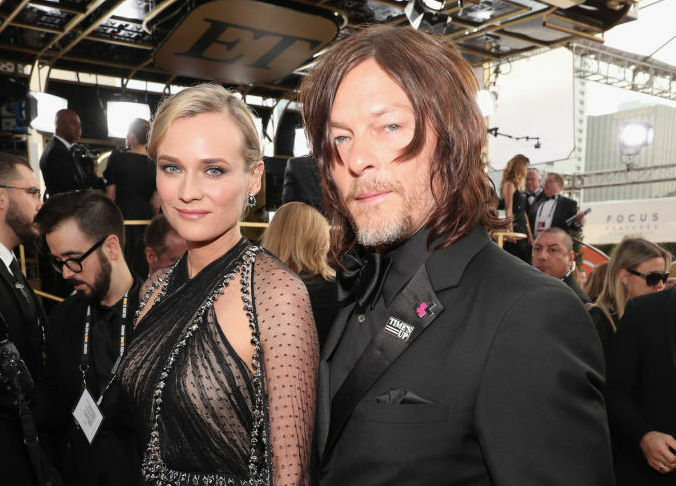 Their meet-cute is a little awk in that Kruger was still with Jackson at the time, but distance and time seem to have worked in everyone’s favor, and here we are, ogling Kruger and Reedus’s love story on the red carpet. The cute couple also kissed on the red carpet, which had fans of the duo going gaga. At the awards ceremony itself, Kruger’s film In the Fade went on to win Best Foreign Language Film, while Reedus’s show Ride With Norman Reedus was nominated in the Best Unstructured Reality Series category.